I was recently inspired to return to Vietnam Noodle House on Swanston street recently by Krystal's winning entry in my 'The Flavours of Vietnam' cookbook giveaway. 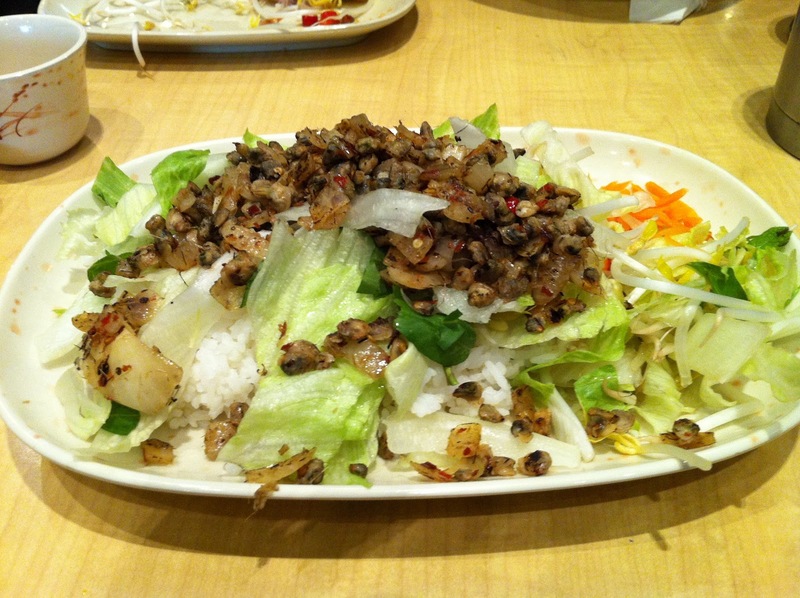 I asked readers to tell me about their favourite Vietnamese dish and where you ate it. In her comment Krystal reminded me of a very tasty and little known Vietnamese dish Com Hen. Krystal's comment: favourite vietnamese meal was at a small restaurant (there was no signboard of course!) in Hue called Com Hen... unfortunately i have not come across this dish anywhere in Melbourne! I like Vietnam Noodle House although I wouldn't say its one of my favourites, more accurately it's one of the better CBD Vietnamese options and a busy one at that. The stern yet efficient staff allocate diners to tables with expertise and precision of a tetris champion ensuring there is barely a spare seat available during the busy lunchtime hours. 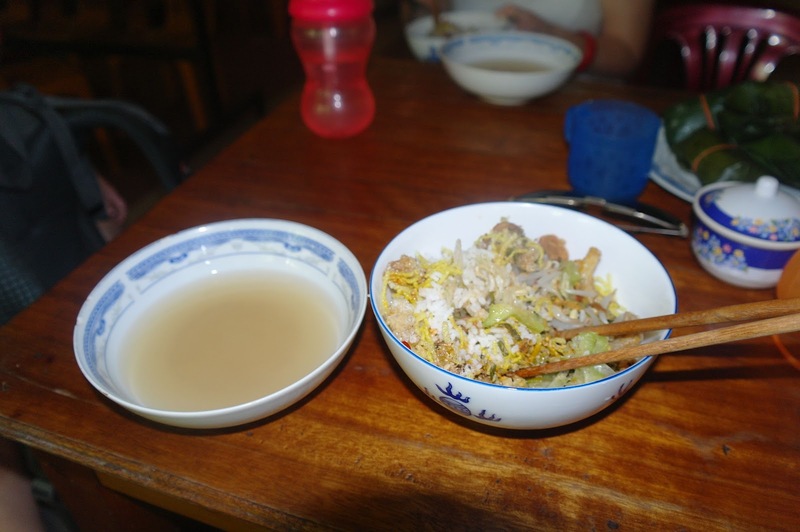 Like Krystal, I also first tasted Com Hen when we visited Hue. We asked our cyclo driver to take us to a restaurant that served the local specialty which I was expecting would be Bun Bo Hue. I was pleasantly surprised to be taken to an inconspicuous little cafe that served Com Hen. Com Hen is a simple but very tasty dish consisting of rice, lettuce, sprouts, fried pork crisps and tiny baby clams. The photos above is the actual dish we ate that day. It was wonderfully light and refreshing and very satisfying on an extremely hot day in Hue. I also remember our cyclo driver schooling me on the correct pronunciation of Com which is rice in Vietnamese. That day I learned that it isn't pronounced 'com' but more 'gorm' which certainly helped for the remainder of our holiday. Perhaps not so much as our favourite phrase 'hong da' meaning no ice but still very useful. Com Hen is tucked away at the back of the extensive VNH menu and while not exactly the same as the version we ate in Hue is was still delicious and also wonderfully light and refreshing even on a not so warm Melbourne Autumn day. In writing this post I realised that I had a nagging question about Com Hen that I had never really answered. What puzzled me was the use of the delicious baby clams that are the main ingredient in this dish. How is it that clams are used in a dish that is the specialty of Hue, an inland city miles from the coast? Given Vietnam's general lack of refrigeration it struck me as very unlikely that they would be transported to Hue all the way from the coast. After a bit of research I discovered that the baby clams are in fact farmed in the freshwater of the Perfume River near Hue. Unsurprisingly Vietnam Noodle House's version is not at the level of what we ate in Hue but it is quite tasty and as there are no other establishments (that I'm aware of) that serve Com Hen it might just be the best version in Melbourne! I'm pretty sure the clams used are of the tinned or possibly frozen variety as I haven't seen fresh ones for sale anywhere locally. The tiny little molluscs are about half a centimeter in diameter and I can imagine that shelling them is a tedious task. The Vietnam Noodle House version of Com Hen is definitely worth seeking out, especially if you are like me and have made it your mission to try as many of the amazing and diverse Vietnamese dishes as possible. The clams are not overpoweringly strong and they aren't particularly fishy, the best I can offer is that the taste could loosely be compared to mussels. When used in Com Hen they are cooked with chilli and onion which provides most of the flavour of the dish. The chilli combines perfectly with the lightness of the fluffy rice in a classically Vietnamese style while the crispiness of the lettuce, sprouts and shredded carrot adds a fresh texture. Thankyou to all those who took the time to tell me about your favourite Vietnamese meals, its always nice to discover new dishes and the establishments where they can be enjoyed. On that note, if anyone knows anywhere else in Melbourne that serves Com Hen please enlighten me and leave a comment. Great post. 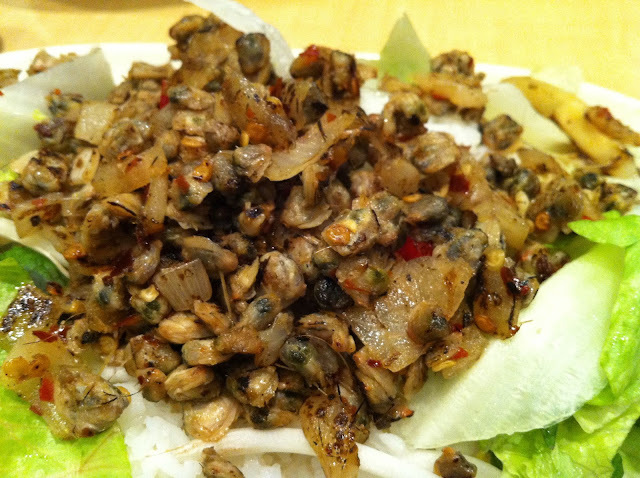 I always like hearing about regional specialties from Vietnam, and I am a big fan of clams too! I wonder if this dish is hidden in the menus of a few restaurants in Footscray? Thankyou Andrew. You'd think Footscray would be a sure thing for Com Hen but I haven't seen it yet. Springvale would also be worth a search. Visa requirements Vietnam are not extensive, and the majority of these requirements can be fulfilled by most people. Most of these requirements are needed by the agent that is procuring your pre-approved letter http://greenvisa.io/ Green visa Agent help you if you need anything they Are with you.